Born in 1969, Darrel Cadman is the brother of well-known silversmith Andy Cadman and a half-brother of renowned smiths Gary and Sunshine Reeves. This group of relatively young smiths (35 to 40 years old) all learned much of their trade from David Reeves (Gary and Sunshine's full-brother who is now deceased). The Cadman brothers and the Reeves brothers, therefore, share a common element of apprenticeship and exhibit certain similarities in their work. Darrel has been smithing silver since 1992. This is one of a group of rings we commissioned Darrel Cadman to make using a variety of our best stones. We wanted a Traditional Revival piece that would show Darrel's skill in executing deep, precise stampwork and would have nice decorative detailing, while remaining wholly unisex in its appeal. We also insisted on the shank being heavy so the piece would be rock solid and feel that way in the palm of the hand. A ring such as this will have heft and weight when held in the palm of the hand, but once it goes on the finger, if it fits properly it will seem light as a feather and in no time one won't even be conscious of wearing it. We are immensely pleased with the results of his fine silversmithing. This high-domed oval stone of natural, untreated Carico Lake turquoise from Nevada was cut for us by master lapidary Bruce Mead. This stone is slightly opaque with some webbing on one edge and black chert matrix marking another edge. 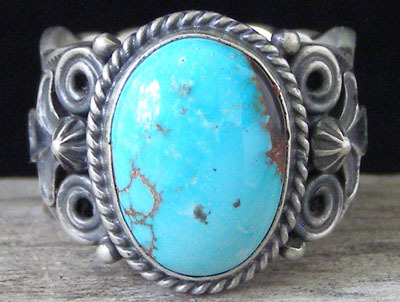 This stone is set in a 3/16" straight-edged bezel wrapped with twist wire. The hefty 14-gauge Sterling shank has scallop cut edges and is deep-stamped with classic motifs. Appliquées, starred buttons, scrollwork and tiny raindrops frame the stone to left and right. An example of Darrel's work is pictured on page 48 of American Indian Jewelry I: 1,200 Artist Biographies by Gregory Schaaf (photo provided by Chacodog.com). Hallmarked "D. Cadman" and stamped "Sterling" inside. Ring face: 13/16" x 5/8"